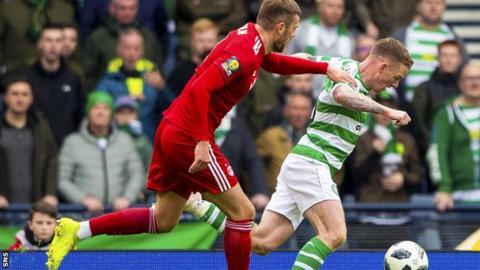 Celtic's "brilliant" disciplinary record has been earned despite teams attempting to "get us caught up in things", says winger Jonny Hayes. The Scottish Premiership leaders players have received 34 yellow cards in the league this season - the lowest tally - and are one of six clubs to have had three players ordered off. Hayes won a penalty in Celtic's 3-0 rout of nine-man Aberdeen to set up a Scottish Cup final against Hearts. "The key word was discipline," he said. Celtic and Rangers players were involved in a mass confrontation after Neil Lennon's men won a hot-tempered Old Firm derby earlier this month, in which two Rangers players were dismissed. "Especially after the Rangers game, there's always talk about discipline," Hayes said. "People seem to want to get us caught up in things - it doesn't necessarily work. "We're normally calm on the pitch, that stems from the previous manager [Brendan Rodgers]. We kept our discipline, not just red and yellow cards, but we kept our shape, our game plan and it worked for us." Celtic remain on course for a third straight domestic treble. Lennon's side are two wins from sealing an eighth Scottish Premiership title in a row and face Hearts for the cup on 25 May. Hayes' manager, who replaced Rodgers in late February, said the Irishman had a "great game" in Sunday's hammering of his former side at Hampden Park. The winger suffered a tibia fracture in December 2017 that ended his first season at Celtic since leaving Aberdeen, but he has featured in four of the club's last five matches. "Ever since I've had the injury I've cherished every game. The manager's always had wingers in his teams and at the minute I'm getting game time and I'm happy because the team is winning," he said. "We've still got a few league games to go, we'll put the final to the back of our mind. We've a couple of wins to achieve the league title."